I’m of the opinion that in India the BMW G310 GS is overpriced by INR one lakh (around USD 1,400). The on-road price is INR 4.3 lakhs which is quite steep for many. I understand that BMW Motorrad wants to remain a premium brand, even in the small capacity segment, which is perfectly fine. I believe the extra lakh is for the premium BMW experience that is associated with the brand worldwide. However, since BMW doesn’t sell directly to customers it has delegated the job of offering the premium BMW experience to its dealers, which is also perfectly fine. He sent me an invoice later that day. Something made me check the numbers. The RTO amount seemed off by quite a bit. I thought Bavaria had use the road tax percentage for Maharashtra instead of Goa, where I would be registering the motorcycle. I called to clarify and let the sales guy know that the RTO amount was extra by INR 15,000 (USD 205). He insisted that the amount was right and after a lot of back and forth admitted that the extra amount was for “handling charges”, something that was mentioned in the fine print at the very bottom of the invoice. I reminded him that handling charges had been declared illegal by a consumer court in India. His reply took me by surprise. He said that unless I paid the 15,000 my bike would not be released. It sounded like a ransom to me. Maybe that’s because the 15,000 was precisely that. A ransom. Although 15,000 was a significant amount I wasn’t in the mood to argue and fight. I just wanted to get it over with. So in my mind I was willing to pay the ransom. But then the sales executive asked me to speak to his boss, the sales manager, and see what he had to say about the extra 15,000. So I called the sales manager and asked him for the reason for the extra 15,000. The sales manager replied, “Sir, that’s for the shipment of the bike from the factory to our warehouse and storing it there”. Upon hearing these words I lost it. As if holding my motorcycle hostage wasn’t enough, this guy was now bullshitting me outright. I work for a company that’s in the business of manufacturing and selling premium equipment and I know exactly how important it is to treat a customer with respect even when there is a disagreement. I decided to indulge the sales manager and see how deep a hole he could dig himself into. “Oh really?”, I said, “If that’s the case, then your invoice should have an ex-factory price on it and not an ex-showroom price, right?” There was silence for a while. Then he blurted, “No Sir. The invoice always has the ex-showroom price”. I replied, “Sure it does. That’s because all the costs incurred till the bike leaves the showroom is included in ex-showroom price. But you are charging me 15,000 extra to ship the bike from the factory to your warehouse. Something isn’t right, don’t you think?”. “So do you admit that you are doing something illegal here?”, I asked, not really expecting him to say yes. But I wanted the conversation to end, one way or another. I was already willing to pay the 15,000 ransom and I was beginning to wonder why I was wasting my time talking to this sales manager who clearly didn’t know how to talk to customers. I didn’t have the time nor the patience to continue the conversation. “Ok then”, I said. “I will call BMW Motorrad India and let’s see what they have to say about this excess 15,000 that you are charging me.” I disconnected the call. But she repeated her line, “Sir, as I said before, this is between you and Bavaria Motors. BMW Motorrad has nothing to do with it”. I realized that this was a waste of time, energy and more importantly, patience, which is something I lack in abundance. I disconnected the call. So now I would like to revise the on-road price of the BMW G310 GS from 4.3 lakhs to 4.45 lakhs. Because if you don’t pay the 15,000 ransom your motorcycle will not be on the road. It will still be in the showroom. 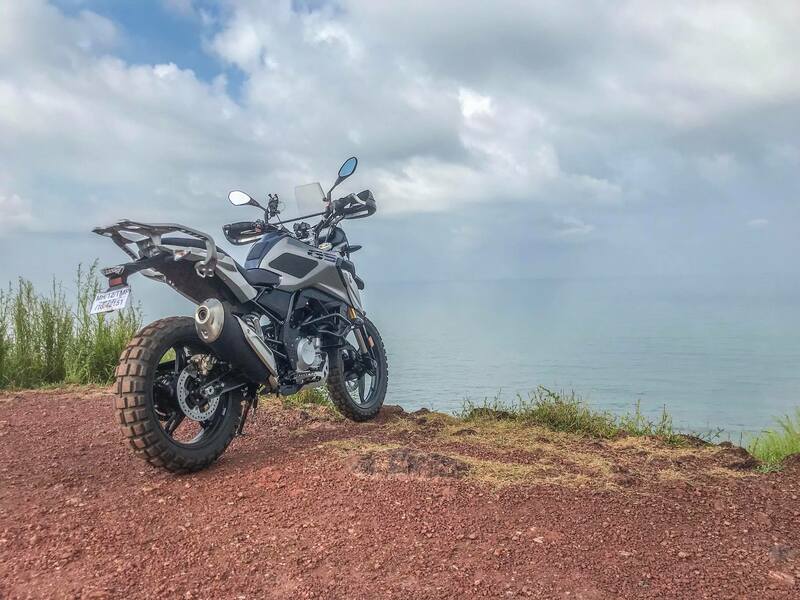 I spoke to other 310 GS owners and found that other BMW Motorrad dealers in India are also making customers pay a handling charge, although the amount is around 10,000. I wouldn’t want to name the dealers since I don’t know for sure. But I can confidently name Bavaria Motors as I paid the 15,000 ransom to release my 310 GS. I have the invoice and receipt to prove it. Customers aren’t even aware that they have been overcharged as they don’t bother checking the RTO amount. Even I wouldn’t have come across the overcharge had it not been for the blunt message from the sales executive to “make balance payment” which peaked my interest and started this whole thing. So I made the balance payment along with the 15,000 ransom and waited for the delivery date of my motorcycle. However, it didn’t end there. BMW Motorrad India had to do something about my email which was forwarded to them by BMW Motorrad Germany. So they spoke to Bavaria Motors and after a few days I received a call from a senior sales manager there. Again he tried to justify the 15,000 ransom and I asked him to stop wasting my time. I had already paid the ransom and all he needed to do was release my motorcycle. At that precise moment I realized what an interesting blog post this whole thing would make. So I said to him, “OK, this is is what is going to happen. I am going to buy a black BMW G310 GS. And I am going to buy it from Bavaria Motors and no other dealer. I will get the full BMW experience that Bavaria Motors has to offer. And then I will write about my BMW experience on my blog. Don’t worry. I’m not going to drag you to consumer court. I don’t have the time and patience for that. But who knows, someone else might.” I disconnected the call. I do want to point out here that I really like the BMW G310 GS. I know its overpriced and that’s ok with me because I’ve been waiting for something like it for years now. I even bought a KTM Duke 390 and spent a lot of time and money trying to adventurize it, with limited success. So I really don’t mind the premium price for a product that is exactly what I have been looking for. There are some really smart people at BMW Motorrad and TVS who have engineered this amazing product. I don’t want this 15,000 ransom to tarnish them or their work. Just that I have bought premium motorcycles before and the pre and post sales experience has been truly premium. Goa Harley-Davidson has been awesome. Shaman Triumph from Mumbai has treated me like family. Too bad I can’t say the same about Bavaria Motors Pune. But what was most surprising in all this was the attitude and stand taken by BMW Motorrad India and Germany. I expected the Germans to sit upright and take notice when I pointed out that their Indian subsidiary was turning a blind eye to illegal activity by their dealers. But that didn’t happen, which is truly a shame. This is clearly not the BMW Experience that I was expecting. I love the motorcycle. But BMW Motorrad and their dealers really need to change the way they treat their customers in India.